and Reduce Your Computer Operating and IT Costs. For more than 40 years, CAI has been helping small and medium-size businesses solve some of their biggest challenges with feature-rich, industry-specific ERP software. We’ve also invested substantially in technologies that help our ERP software clients secure their business networks and get the most of their information technology (IT) investment. 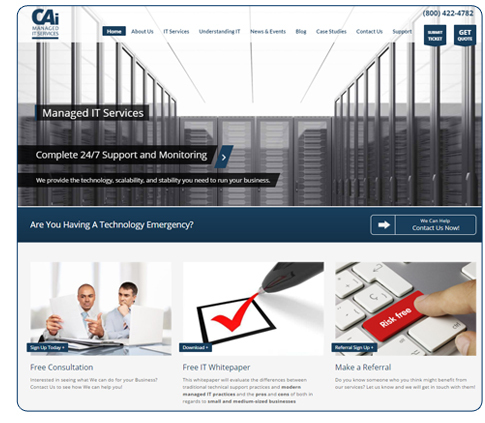 As we continue to expand our managed IT services practice, we have renamed the group CAI Managed IT and invite you to visit our website. It’s designed to make it simpler for clients to access our Help Desk ticketing portal to submit and manage support requests. You’ll also find information about our fully managed, enterprise-level IT support services. In addition to providing excellent support to our software clients, as a Managed Services Provider (MSP), CAI Managed IT can help any business eliminate IT issues before they cause expensive downtime. For a fixed monthly fee, we monitor your systems 24/7, apply patches, ensure backups, keep viruses at bay, and perform a host of other proactive measures. Little problems don’t become big―and expensive―and in most cases you won’t even know there was ever an issue. And we do it with an infrastructure that keeps our prices affordable. Ready to take advantage of all that the cloud has to offer? Our secure and affordable network server hosting or complete Platform-as-a-Service solutions can be a smart choice that can save money! At CAI, we understand that IT has become a significant consideration for small businesses in today’s high-tech society. We also know that small business owners are under constant pressure to conduct business more efficiently while simultaneously reducing costs. Having a complete IT department is not a viable solution for most small businesses, and very few small companies can afford to deploy even one permanent IT employee. Fortunately, CAI Managed IT can provide a smart, cost-effective alternative.